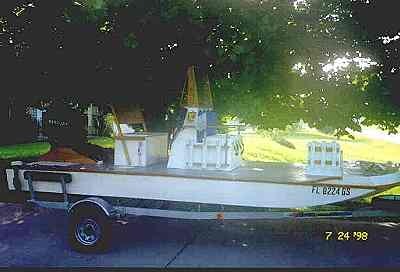 Attached you will find (I hope) a photo of my "Scooter" flats boat completed on 7/25/98 in Tampa Florida. Boat is in Wesley Chapel Florida, has rebuilt 1992, 50hp Merc with electric trim and start, two live wells, twin batteries with Perko switchy, many custom features. On performance "flats" trailer. Next addition is a T-top and poling platform. Hope you enjoy it as much as I did building it.